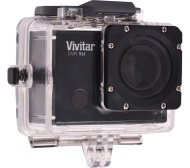 alaTest har samlat in och analyserat 15 tester för VIVITAR DVR944 4K Ultra HD Action Camcorder - Black. Det genomsnittliga betyget av denna produkt är 3.7/5, att jämföra med genomsnittsbetyget 4.0/5 för produkter i kategorin Videokameror. Bärbarheten och bildkvaliteten uppskattas av recensenterna men batteriet uppskattas inte lika mycket. Recensenterna har delade meningar om användarvänligheten. Vi har analyserat betyg från experter och användare, produktens ålder och andra faktorer. Jämfört med andra Videokameror belönas VIVITAR DVR944 4K Ultra HD Action Camcorder - Black med en alaScore™ på 88/100 = Mycket bra kvalitet. the mic is useless in the waterproof case, 4k is at a dissapinting 10fps (unuseable). mic would be better placed if on top, not the back and 720p has badly coloured. Love the waterproof case, the bike mount and the 4K video quality. Battery is not great, nor the helmet strap or the watch provided (which doesn't work at all actually). Not for use on motor cycle helmets, needs more adapters/ fixing bkts. Also watch remote was flat. Super for children because it's easy to use (once you've mastered it), the picture quality on playback (not the monitor screen) is amazing. Great size and weight. Lots of fun indoors and out! Battery life us very disappointing but doesn't take away the fun of using the camera. Good quality recording, good to have LCD screen when recording by hand. Will be very happy has long as it stays reliable, too new to comment on that. Battery life not the best, found most camcorders the same though.